Manchester United meet Rangers at Old Trafford on 4 November for the second of their Champions League Group E encounters. United drew first blood in the first match at Ibrox at the end of October as a Phil Neville goal gave Sir Alex Ferguson's side a 1-0 win. These eagerly-awaited "Battle of Britain" ties have a history of Anglo-Scottish classics to live up to. Here's a look at some of the previous encounters between Scottish and English sides in Europe. The first Anglo-Scottish meeting in European competition saw Rangers reach the final - which they would go on to lose to Fiorentina - after overpowering Wolves in front of 80,000 at Ibrox. Ralph Brand and Alex Scott got the goals to put the Scots in the driving seat in the first leg. Peter Broadbent scored in the return leg for Wolves to give them hope after Scott had given Rangers the lead, but the Glasgow giants held on to progress. With both clubs gunning for their first European final Celtic threw away the advantage of Bobby Lennox's goal early in the second half of the first leg at Parkhead. A two-goal burst in six second-half minutes at Anfield sent Liverpool through to a final they would lose against Borussia Dortmund. Tommy Smith levelled the tie with a thunderous free-kick before Geoff Strong's header edged the Reds through. Celtic reached their second European Cup final in three years after the champions of England and Scotland clashed over two legs. George Connelly got the Hoops off to the perfect start at Elland Road with a strike in the opening minute. Billy Bremner silenced a crowd of over 130,000 at Hampden Park by levelling the tie in the first half of the second leg. But Celtic responded and eased their way into the final - which they lost to Feyenoord - thanks to goals from John Hughes and Bobby Murdoch. Dundee United shocked Ron Atkinson's Manchester United side by earning a 2-2 draw in the first leg at Old Trafford. Goals by Paul Hegarty and Paul Sturrock cancelled out those by Bryan Robson and Gordon Strachan to set up a fascinating second leg at Tannadice. But an own goal by the home side in addition to strikes by Mark Hughes and Arnold Muhren were sufficient to put Man United through, despite goals by Hegarty and Davie Dodds. Rangers claimed the unofficial title of British champions when they outclassed Howard Wilkinson's Leeds in the last game between the champions of both leagues in Europe. Gary McAllister gave Leeds a dream start at Ibrox inside two minutes, but a John Lukic own goal got Rangers back in the game and Ally McCoist gave them a crucial lead going in to the second leg. Mark Hateley scored with a sublime strike within two minutes at Elland Road and McCoist put the tie beyond doubt before Eric Cantona got a consolation late on. Liverpool emerged victorious over two legs in a tightly-contested affair. The Reds took an early lead through Michael Owen before Celtic stormed back to equalise through Jackie McNamara. A Simon Donnelly penalty looked to have given Celtic a deserved victory, but in the 89th minute Steve McManaman waltzed 70 yards through several tackles to score a stunning equaliser. That goal was to prove crucial as Liverpool held on for a goalless draw in the second leg at Anfield and went through on away goals. Having already knocked out Blackburn Rovers in the second round of the competition with wins at home and away, Celtic got their revenge over Liverpool on their way to last season's Uefa Cup final. Henrik Larsson gave Celtic the perfect start with a goal inside two minutes at Parkhead, but Emile Heskey hit back to level a game that was marred by a spitting incident involving El-Hadji Diouf. 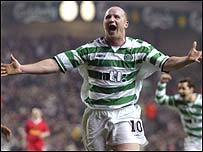 At Anfield Alan Thompson scored from a first half free kick and John Hartson thumped in a cracker late in the game to seal a wonderful win for the Glasgow side.